My co-workers and I are all a-flutter as the U.S. premiere of the new season of “Downton Abbey” approaches! We’re all fans-even the male deputy director of the Library, who I would actually categorize as a “super-fan!” Shameless plug: Our excitement is doubled by an impending visit by Jessica Fellowes, niece of series creator and writer Lord Julian Fellowes, and author of the series companion books! 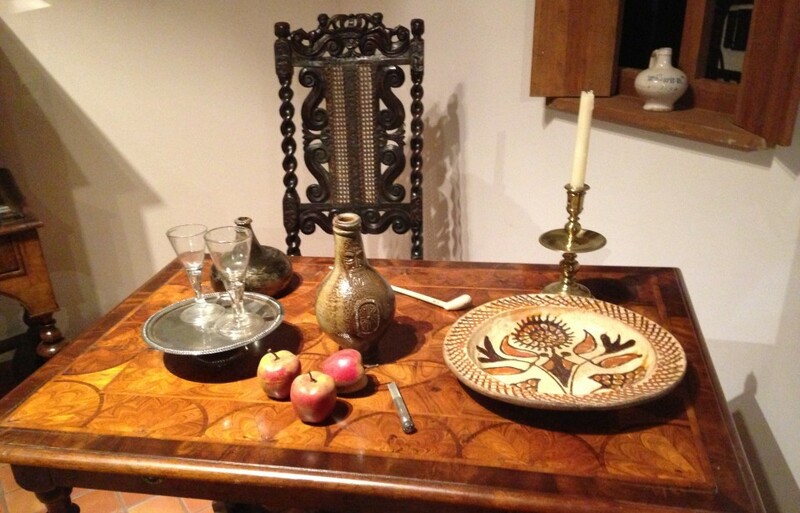 Last year, I did a series of Downton-Abbey themed recipes. 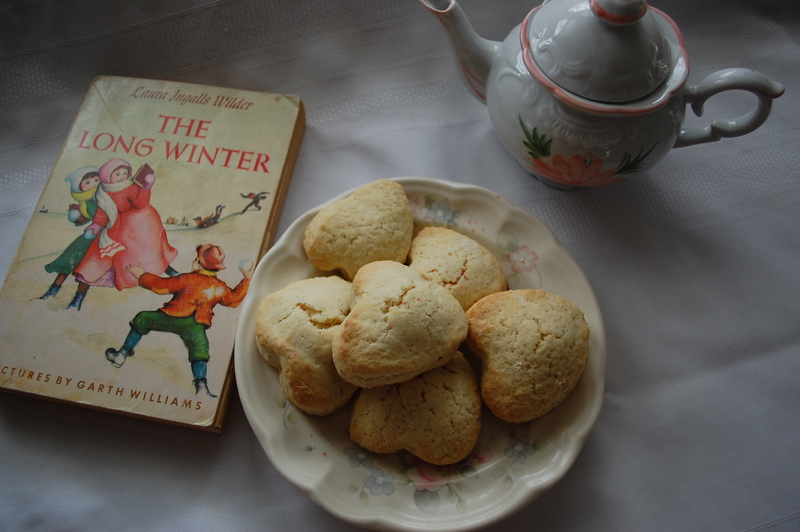 But I neglected to make a good scone recipe and I decided it was high time! 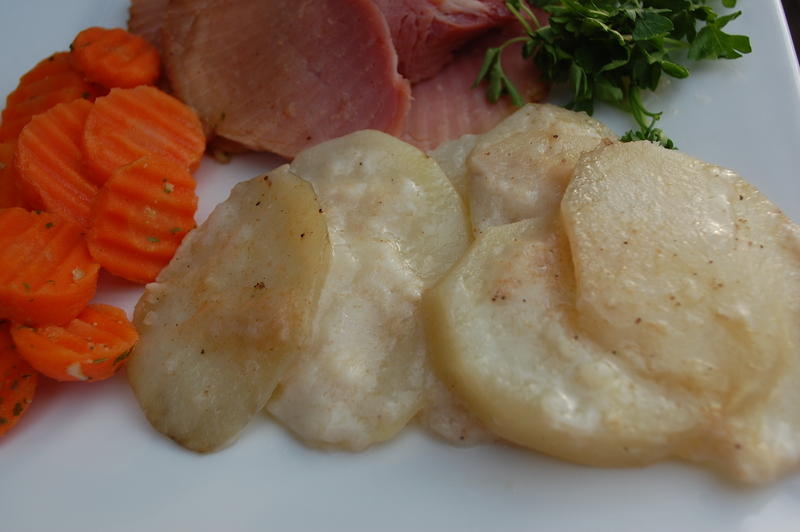 This version comes from Mrs. Wilson’s Cookbook, Numerous Recipes based on Present Economic Conditions, published in 1920. Mrs. Wilson was a cooking instructor for the U.S. Navy and ran a cooking school in Philadelphia. 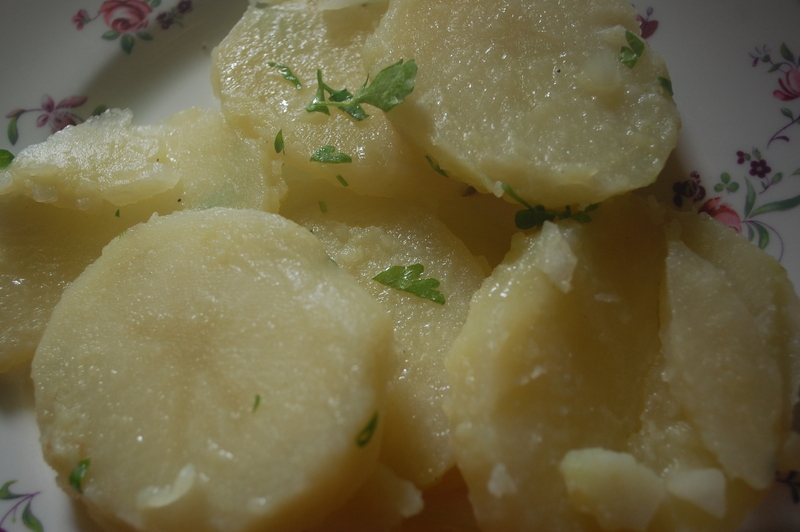 And while the inhabitants of Downton Abbey may not have been so concerned with frugality, this recipe would undoubtedly have been an easy staple in Mrs. Pattmore’s kitchen. 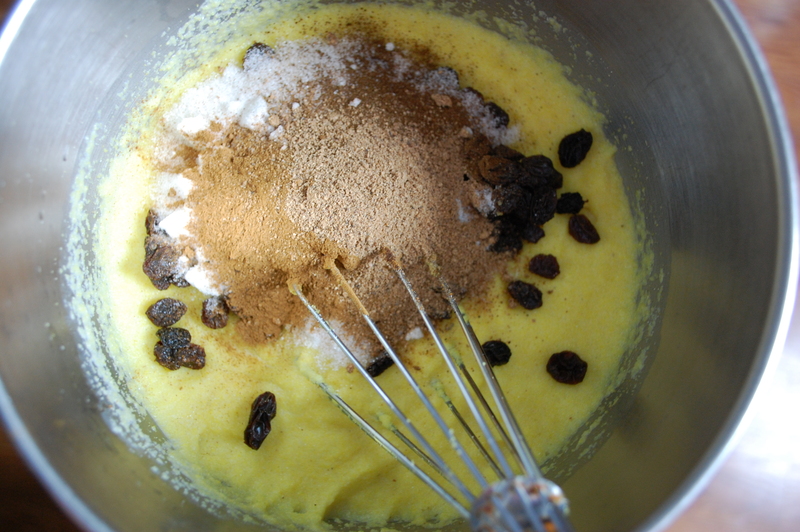 It’s very simple and can be embellished, as I did, by adding “fillings” like dried cranberries or chocolate chips. I also made a simple milk and sugar glaze to give them a little extra sweetness but they taste wonderful without it… or maybe with a little jam, clotted cream, or butter! 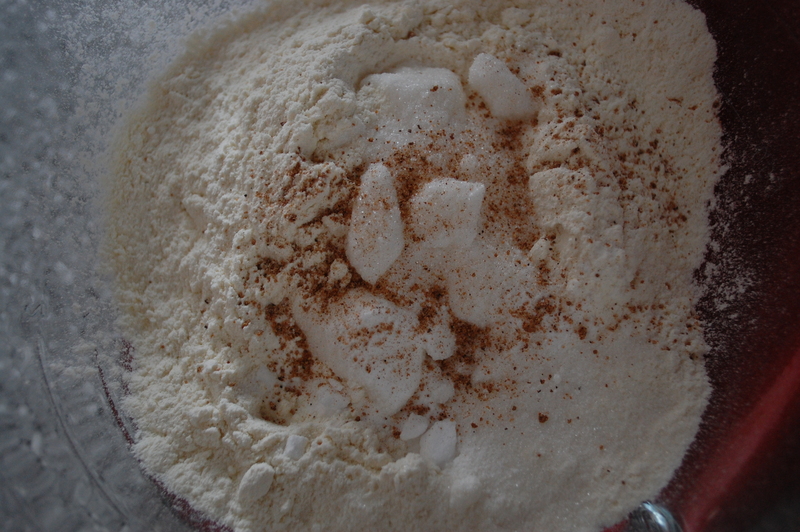 You start with a simple base of dry ingredients. 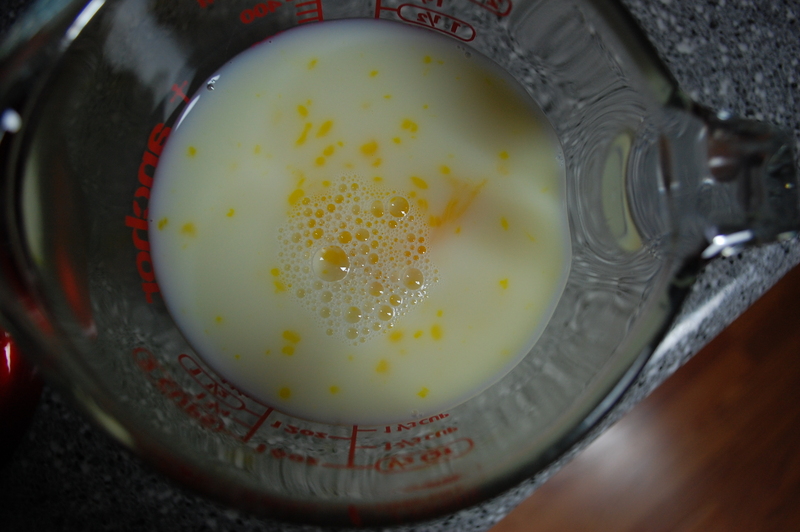 Add milk and beaten eggs. 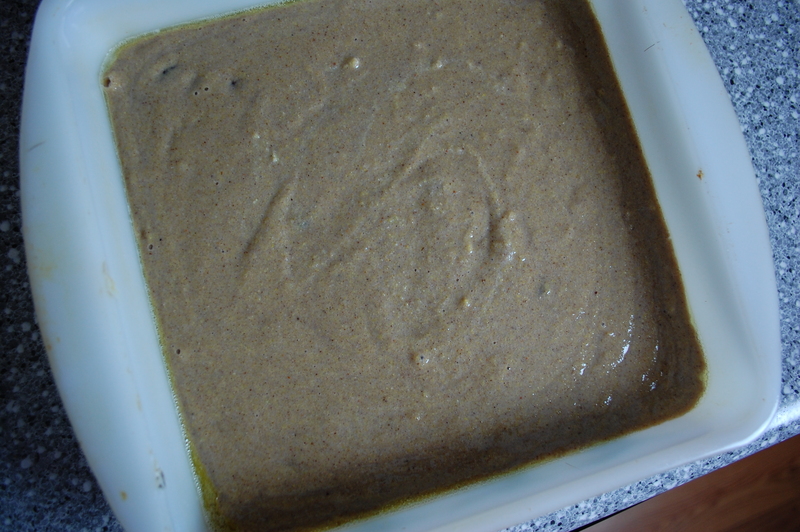 Then knead the dough for a few moments while incorporating a little bit of flour, until it’s no longer sticky. 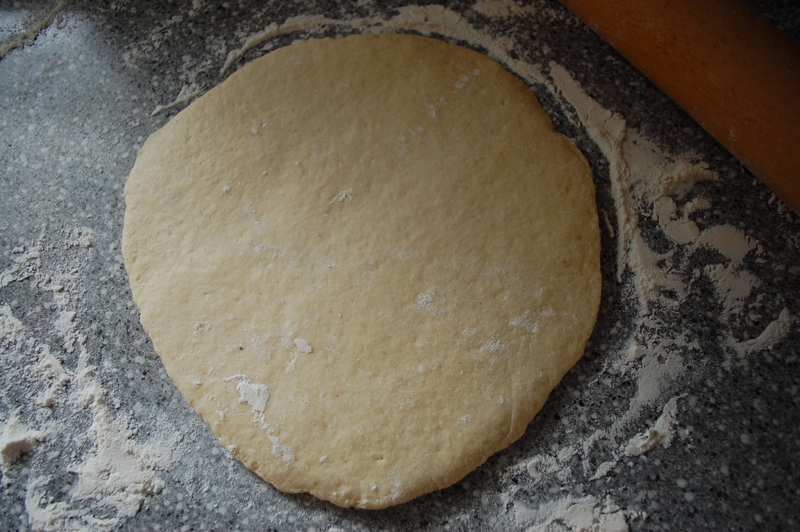 You divide the dough into five parts and you can either leave it plain or add filling. Be creative! Pinch the filling into the dough and then carve each section into four pieces with a pizza cutter, creating triangle-shaped mini-scones! 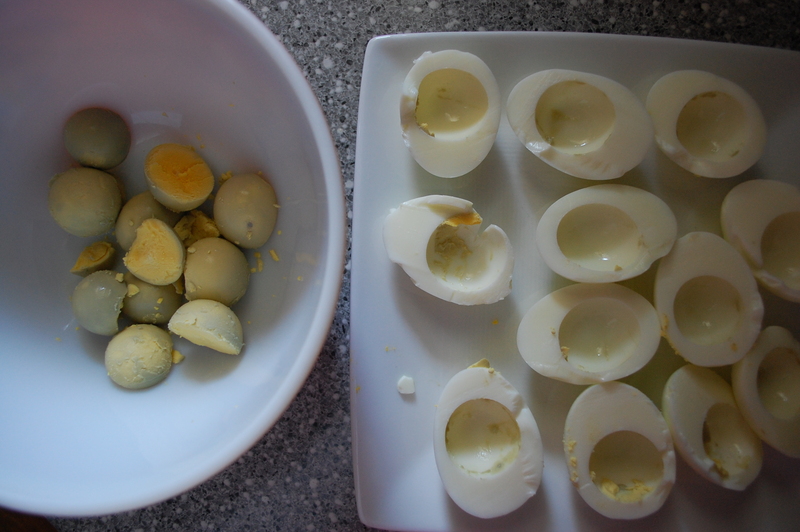 Brush with egg and bake! 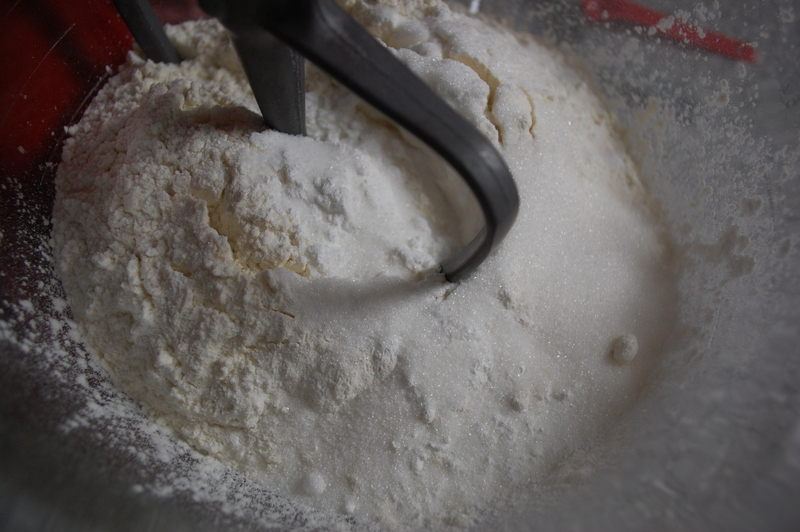 Place flour, baking powder, sugar and salt in mixing bowl and combine. 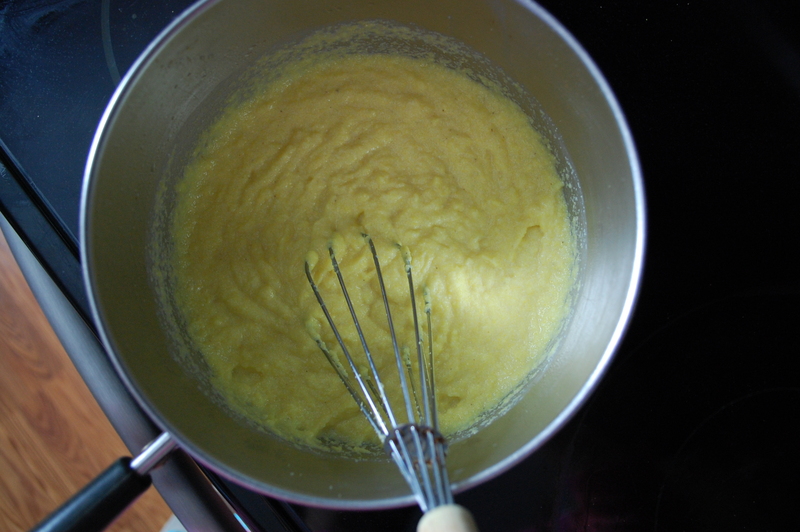 Add shortening one tablespoonful at a time, combining as you go along. 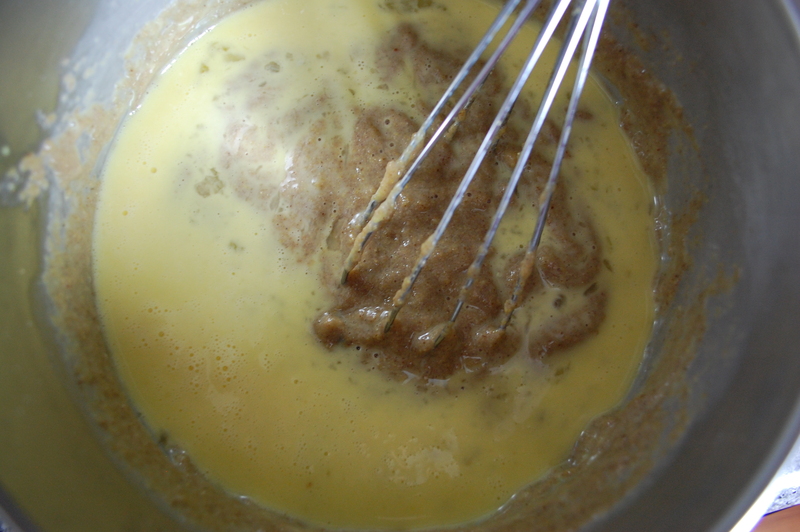 Add one-half of the beaten egg to the milk and combine well, then add that to the flour mixture and combine. 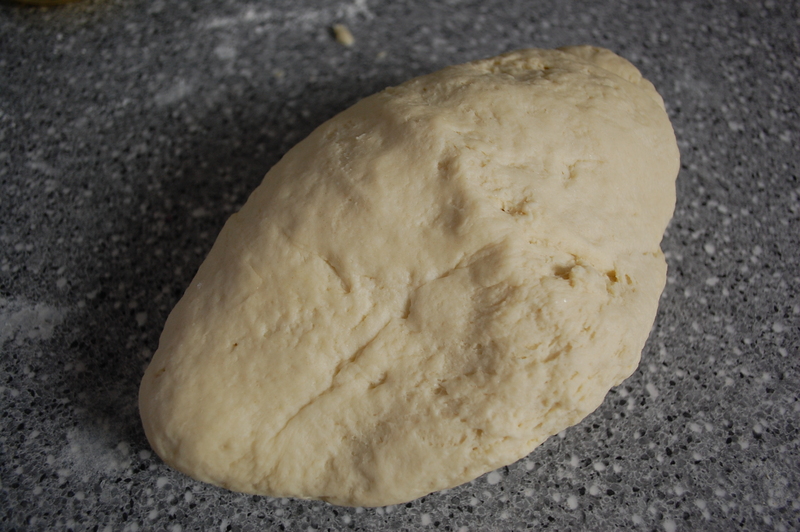 A soft dough will form. 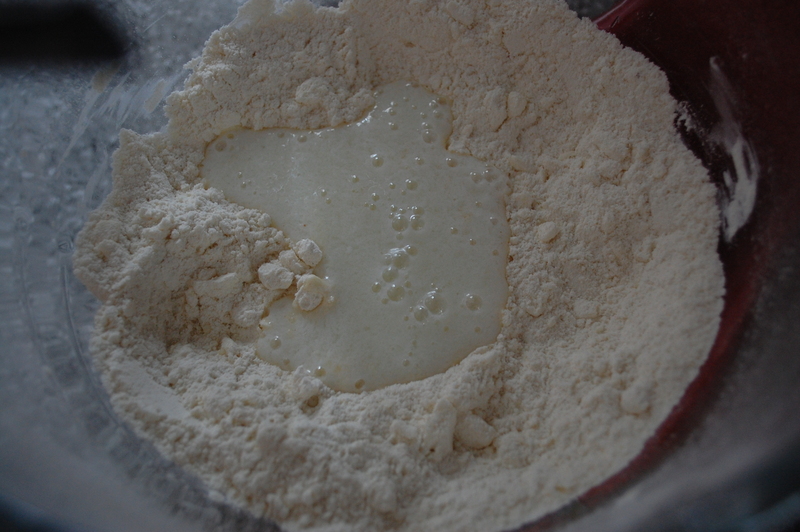 Flour a surface and your hands and remove the dough from the mixing bowl. 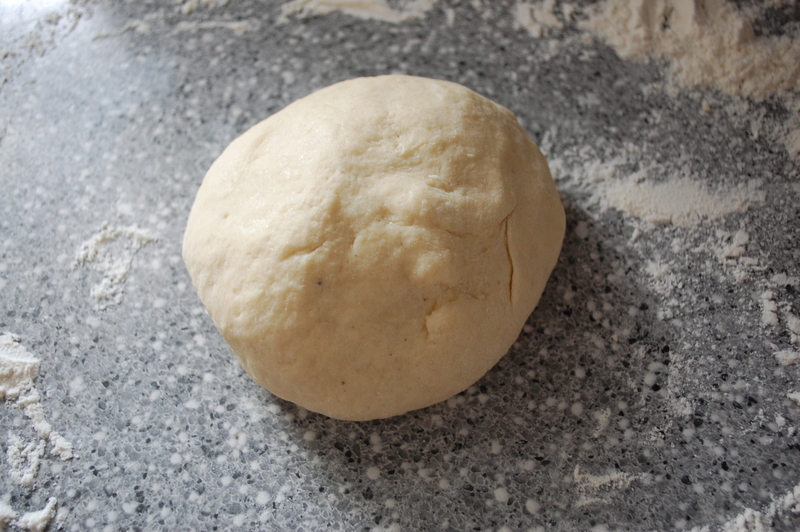 Knead it for three minutes, adding flour a little bit at a time until the dough is no longer sticky. 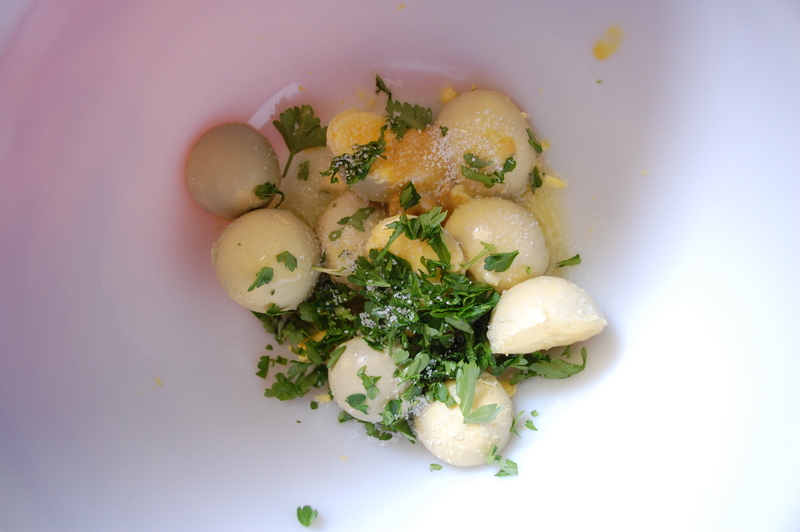 Divide the dough into five balls. 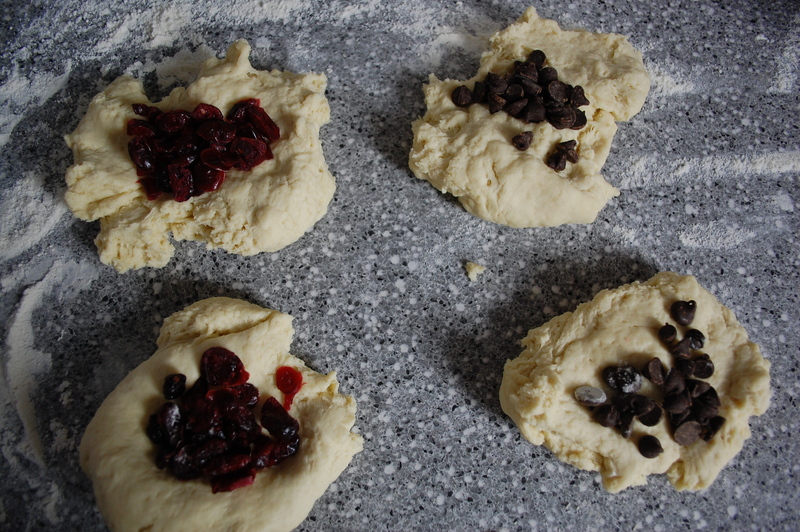 You can either shape these and place them right on a cookie sheet lined with greased parchment OR you can place a spoonful of filling (cranberries, dates, raisins, chocolate chips, figs, jam, caramel) in the middle, then pinch the ends together and form the ball. Using a pizza cutter, cut each dough ball into four, triangle-shaped sections. 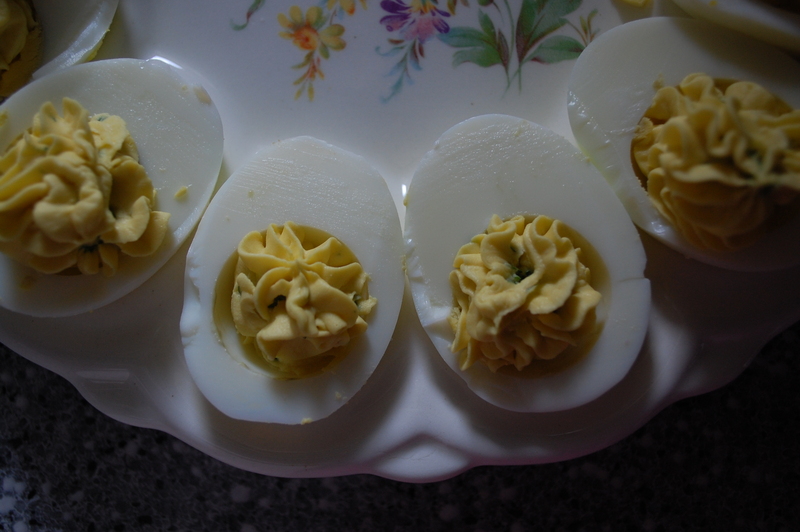 Brush the remaining egg over the top. Sprinkle a bit of sugar over the dough if you like! 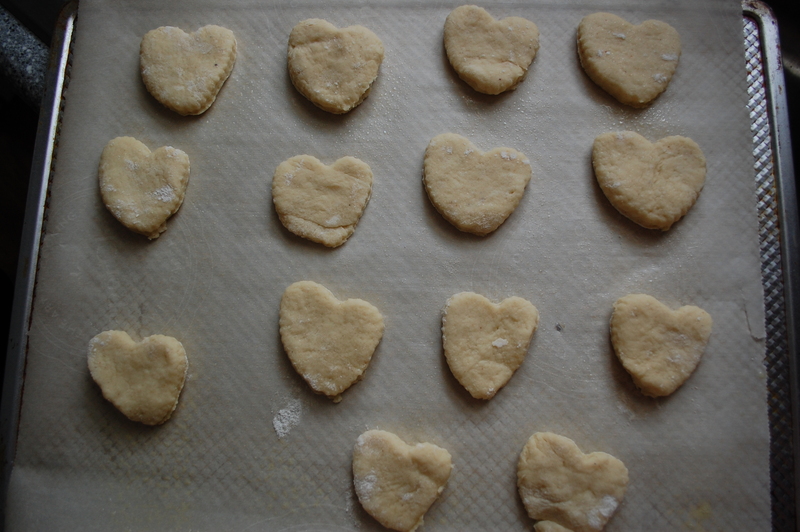 Bake for 20-25 minutes or until a toothpick inserted into the scones comes out clean. To glaze: Allow scones to cool slightly. Mix 1/2 cup of powdered sugar with 1-2 tablespoons of milk in a small bowl. 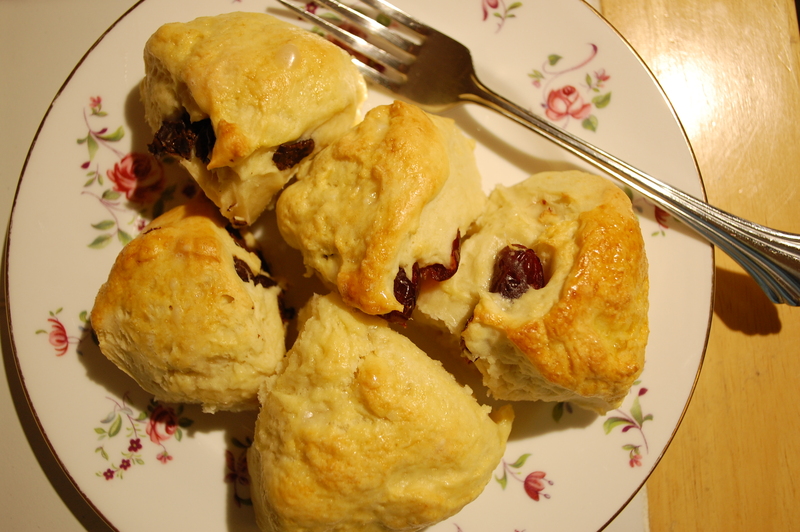 Using a spoon, drizzle the glaze over the tops of the scones. 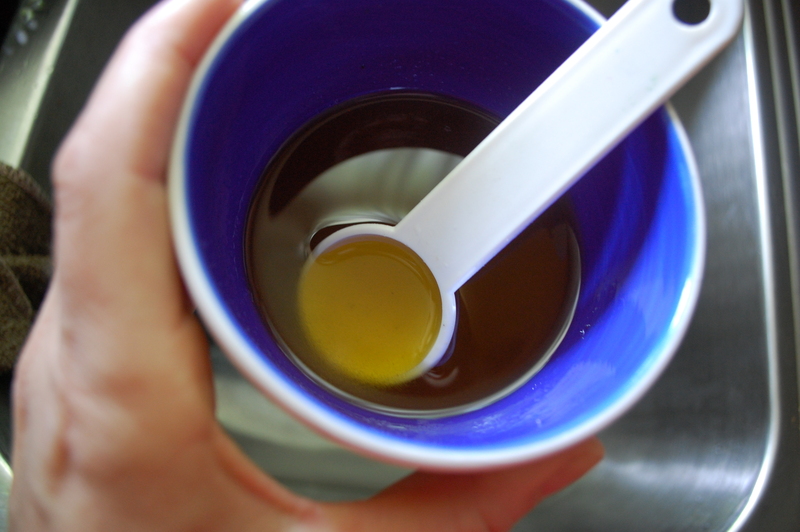 Let the glaze set for a few minutes before serving. 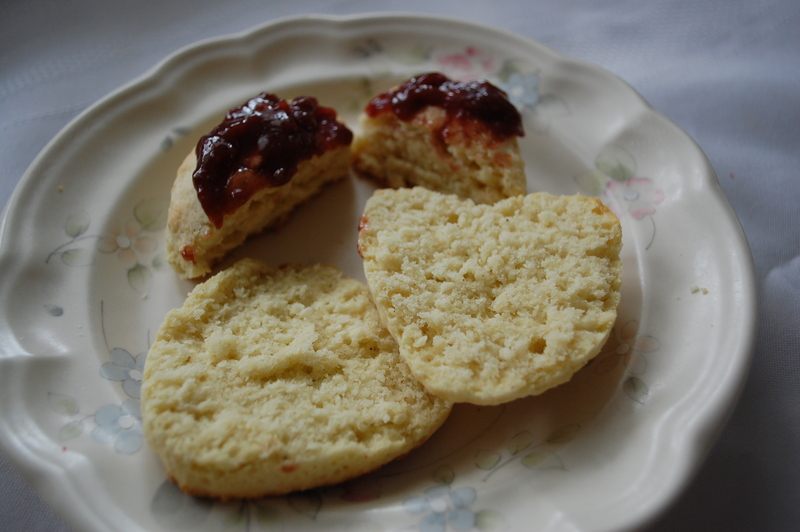 The beautiful finished scones are puffy and wonderful, not sweet-kind of like an embellished biscuit. Recently, my husband and I started to shop at a new produce market. It’s in the middle of the city, in a diverse neighborhood, set up inside an old grocery store. I love it because the prices are great and the produce is all marked with the location or farm from which it comes. Shop local! 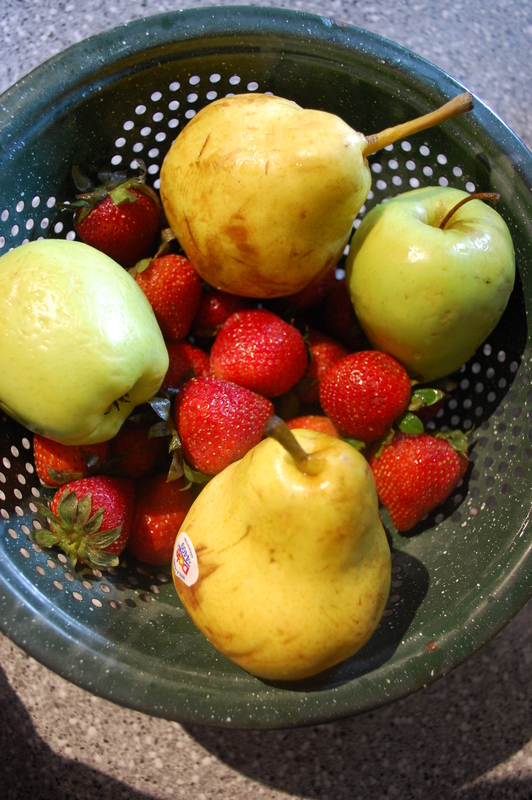 The fruit from the market. So good looking! 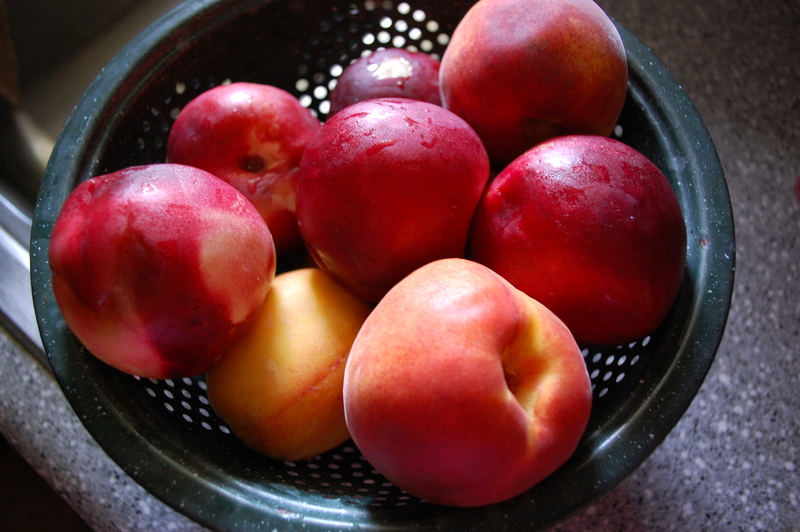 A couple of weeks ago, I scored some beautiful peaches on sale on the discount shelf. They looked lovely to me and I have no idea why they were marked down but I jumped on them. 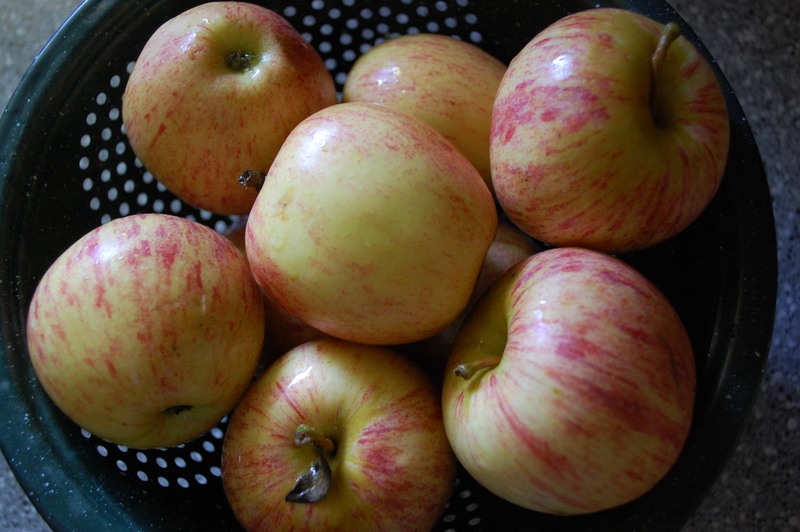 I also got a bunch of white nectarines. I’d been listening to the Good Food podcast and heard a food expert say that they’re a better fruit to use in peach recipes because they’re more flavorful than peaches. 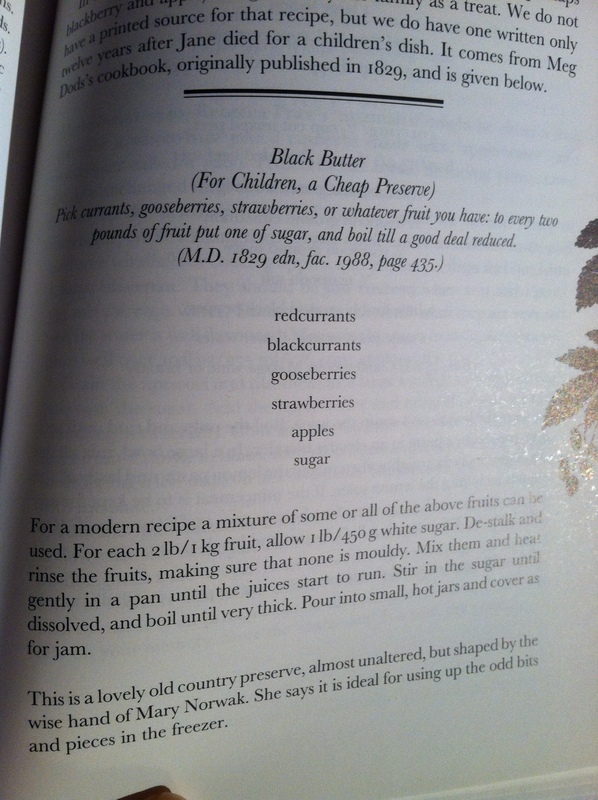 After the success of my Jane Austen’s Black Butter Jam, I’ve become convinced that I never need to buy another jar of preserves. I can just make it. 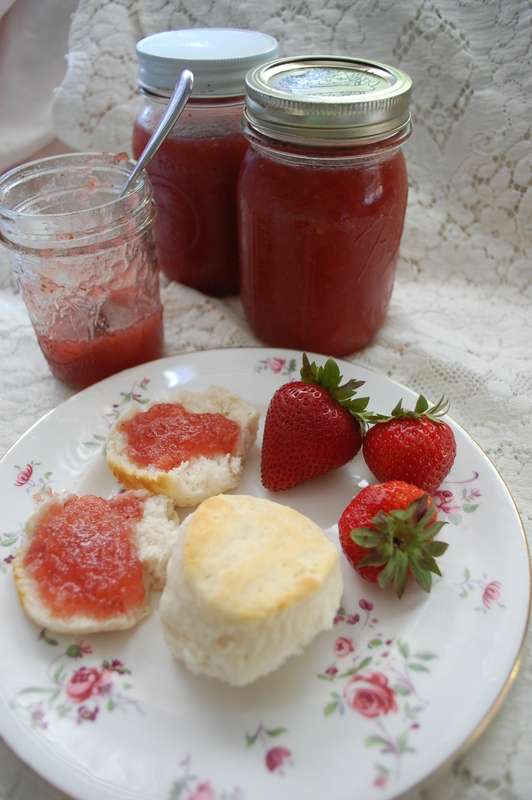 I eat a lot of jam/jelly/preserves. I’m a big fan of bread and I like it with the fruity topping and a cup of tea just before bed. 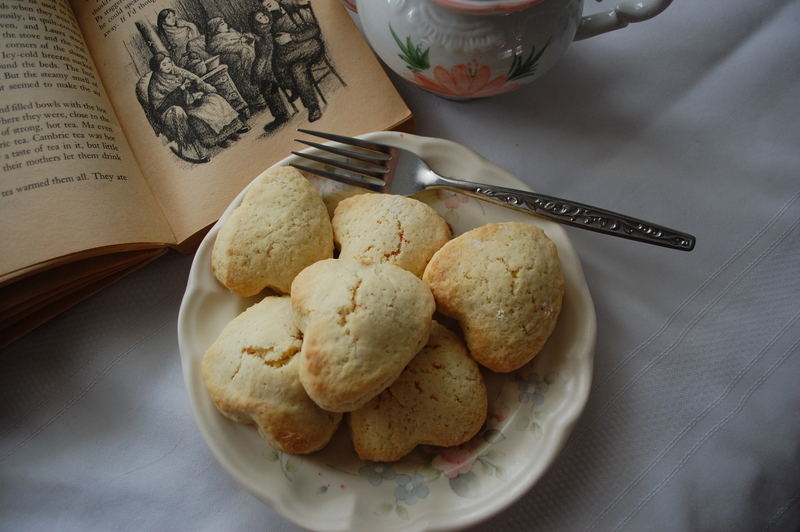 I picked this recipe from the cookbook Martha Washington’s Booke of Cookery, comprised of the former First Lady’s personal recipe collection, written and translated for the modern cook. 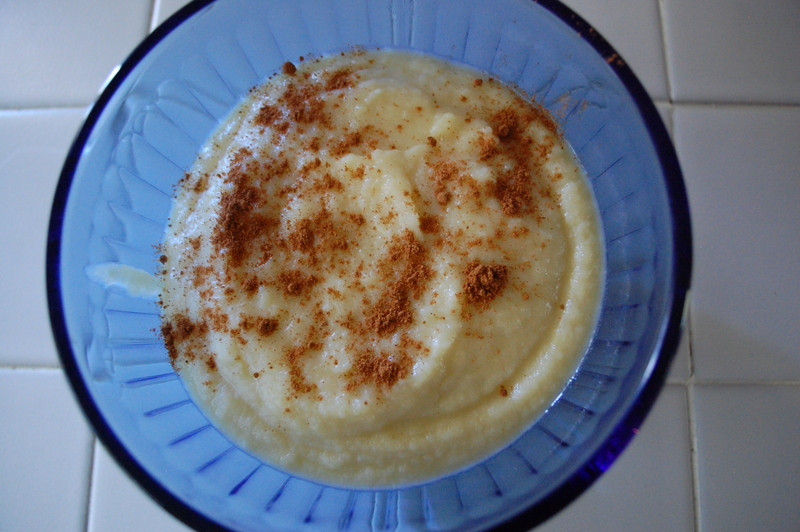 I’ve tried a few recipes from the book before and I like it… it’s fun and challenging. 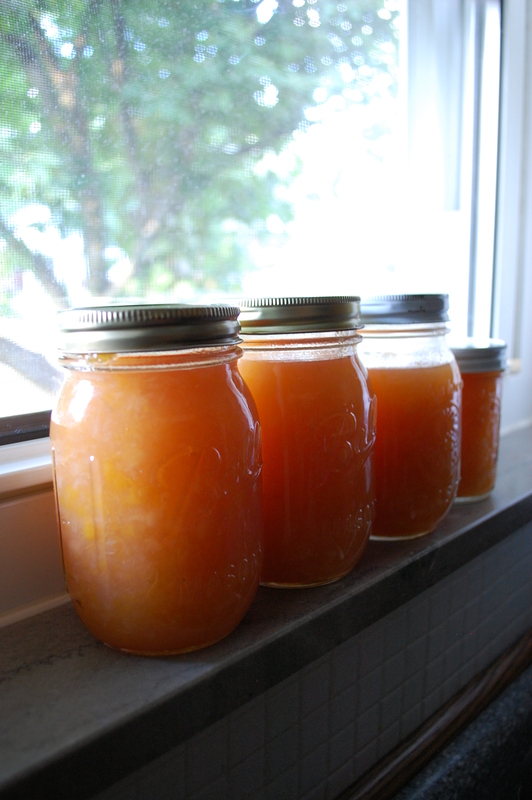 Take a pound of ye fayrest (fairest) and best cullered (colored peaches you can get, wipe of theyr white hore (fuzz on the skin) with a clean linnen cloth, then parboyle them in halfe a pinte of white wine, and a pinte and half of running water, then pill of (pull off) their white scin and weight them and to a pound of peach, take 3 quarters of A pound of refined sugar, dissolve it in a quarter of a pinte of white wine and boyle it allmoste to ye height of a sirrup, then put your peaches, and let them ly (lie) in the sirrup for more then a quarter of an hour. If they require it, then pot them up and keepe them all ye year; they must have a little quick boyle in ye sirrup till they jelly. 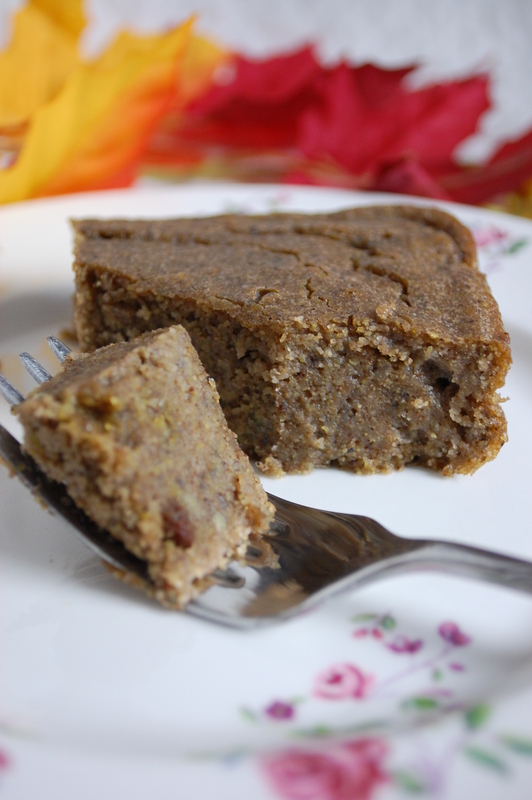 Here’s how you can recreate this recipe. 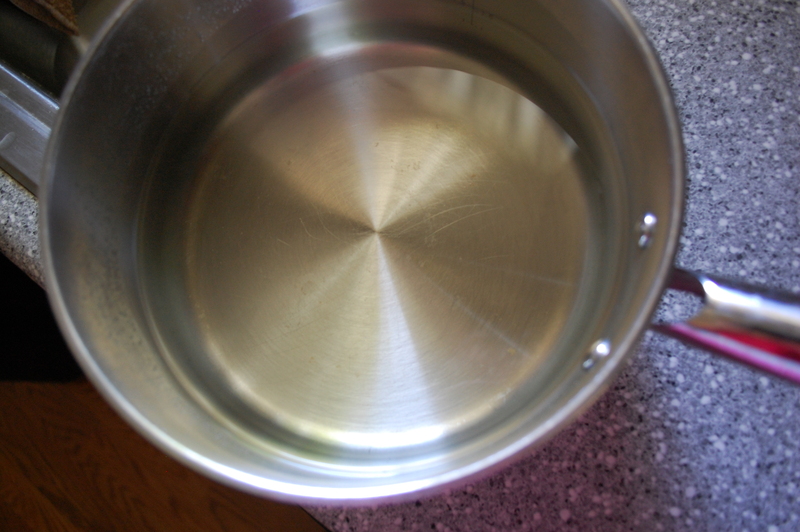 Bring 1 cup of white wine and all the water to a boil in a medium saucepan. Water and wine to blanche your peaches. 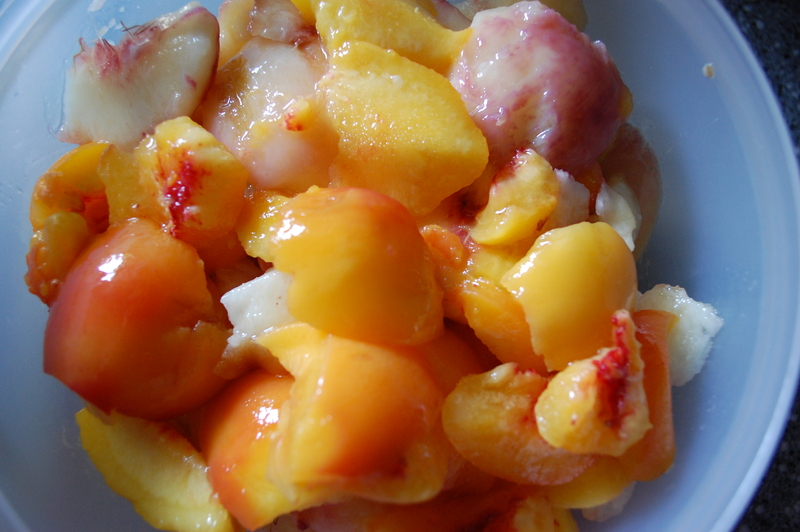 I honestly don’t think you will affect the taste all all by just blanching the peaches in plain water-but you know, I was trying to follow the recipe by the letter! 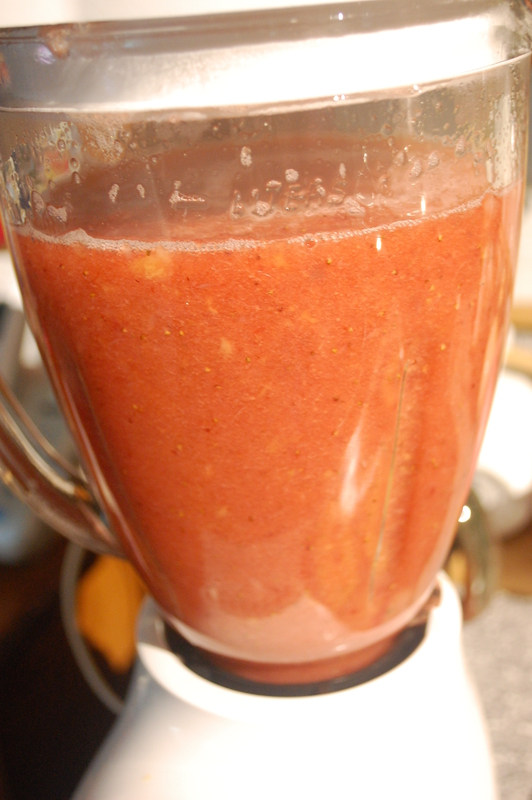 Drop your fruit in, one at a time, and blanche for 1-2 minutes. 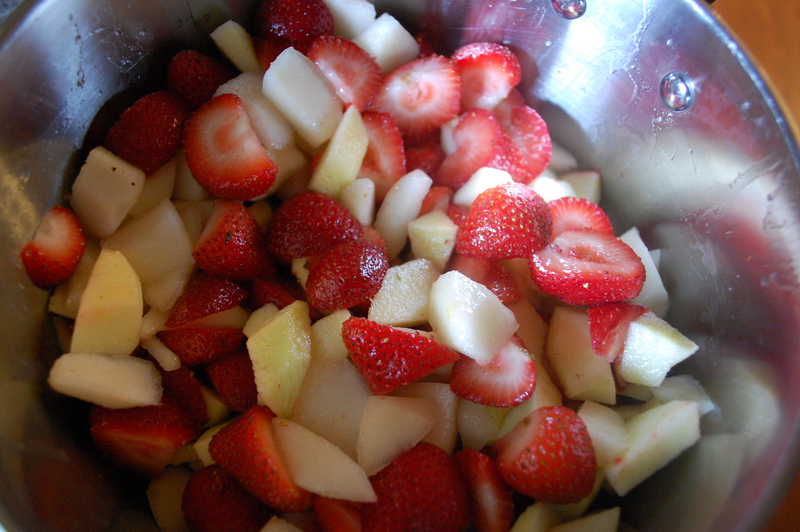 Then dip the fruit into an ice bath and peel off the skin. Remove the stone or pit from the fruit and chop the fruit. Dump out the wine and water in your saucepan. Put it back on the stove and add a cup of white wine and 1 1/2 cups of sugar. Bring it to a boil and stir constantly until the sugar is dissolved, then keep boiling until the liquid is reduced by half and starts to look syrupy. 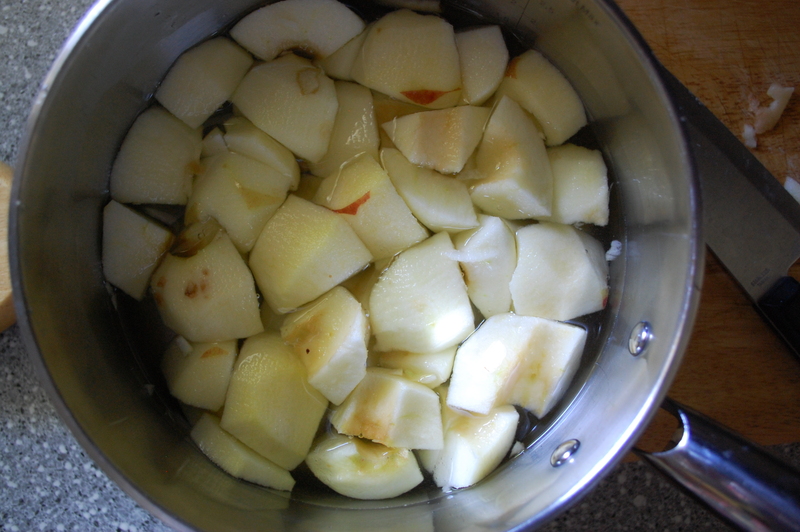 Add the peaches, reduce the heat to a simmer and let it simmer for 15 minutes. Sorry, I was too busy stirring the pot at this point to take photos! 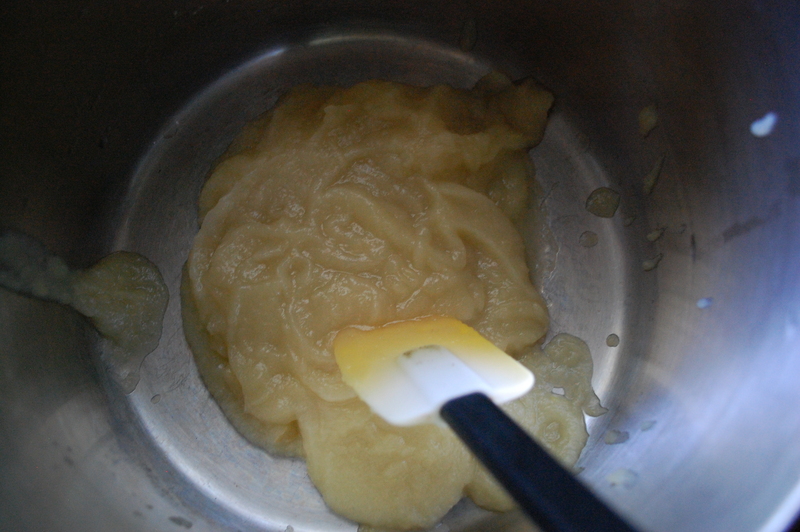 Take the pot off the stove and let it cool, then run the mixture through the food processor and put into jars. You can refrigerate the jars or can them, depending on your preference. 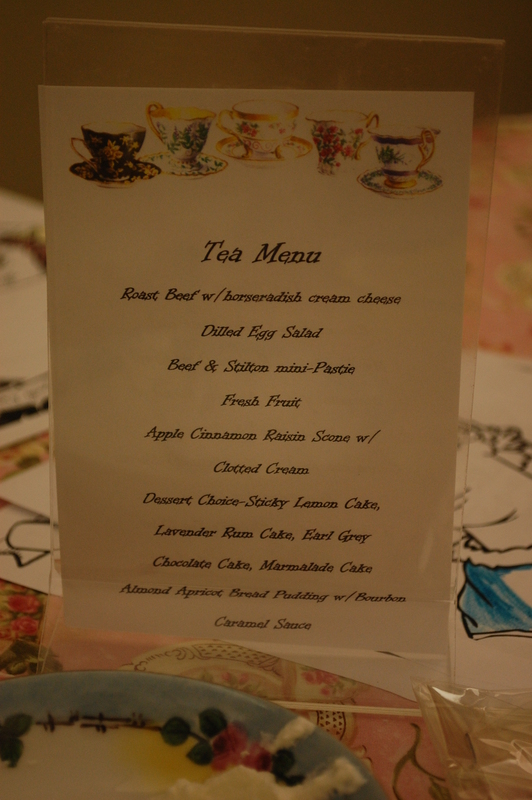 When my daughters and I spent a day last summer at the Jane Austen Festival in Louisville, Kentucky, we took part in an afternoon tea. Besides drinking about three pots of delicious tea between us, we stuffed ourselves with an amazing array of tea-time food-pastries, cookies, and more substantial offerings like Beef and Stilton Pasties. 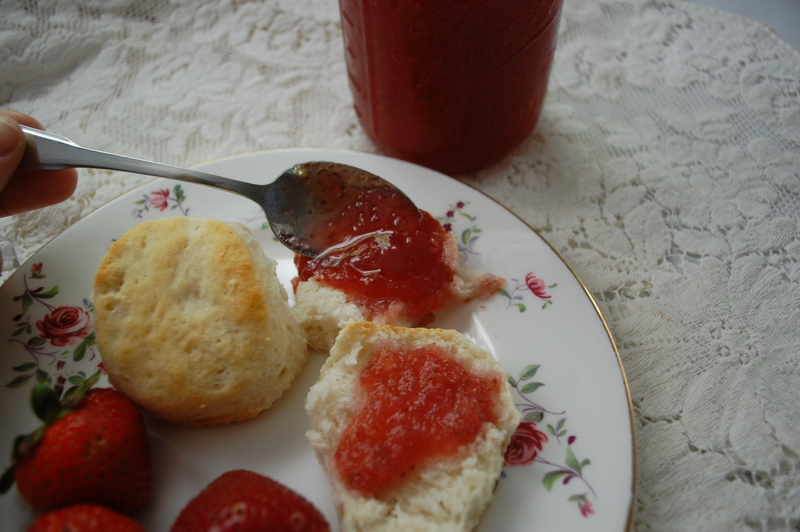 Bonnie Wise, one of the organizers of the festival and a member of the Jane Austen Society of North America, was kind enough to answer a few questions for me via email-and to send me two recipes from that afternoon tea. I saved them for a whole year so I could make them as part of my series leading up to this year’s festivities, now less than one week away! 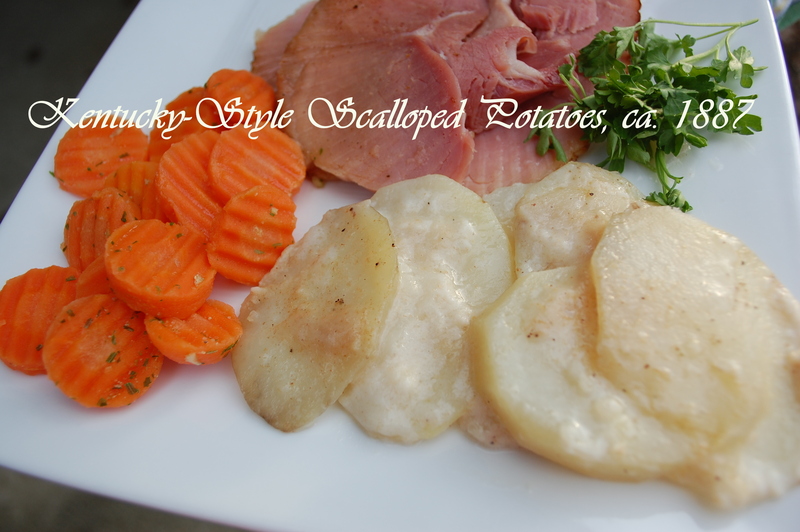 I had to modify the recipe slightly, due to a mistake I made at the grocery store. 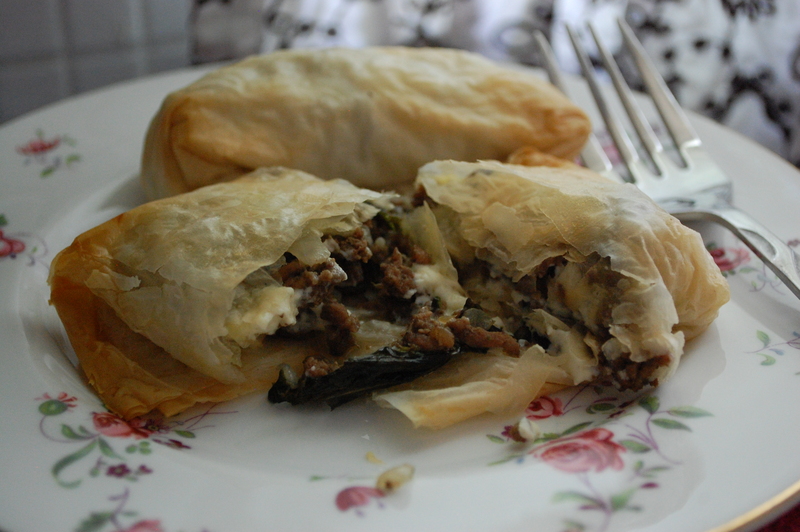 The recipe calls for refrigerated pie crust, but I got it into my head that the meat was stuffed into puff pastry! It turned out delicious and I’ve included instructions for using either one, according to your taste. 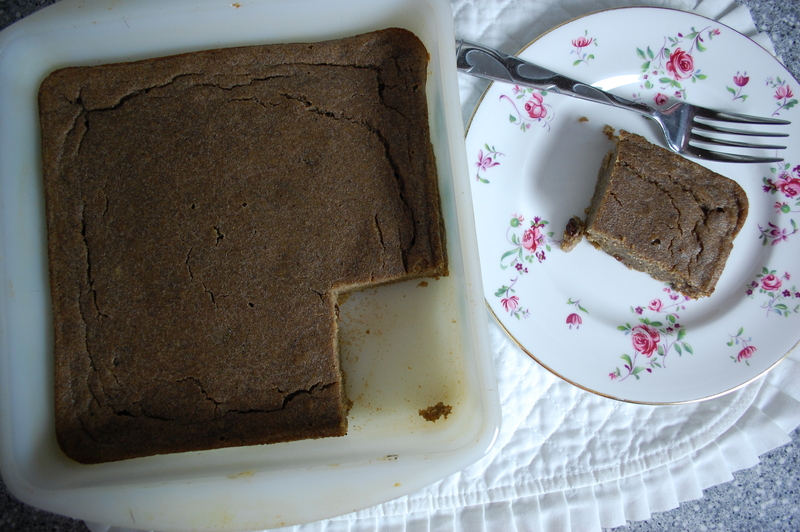 Bonnie says the recipe is based on one found in Victoria Magazine called TeaTime Bliss. 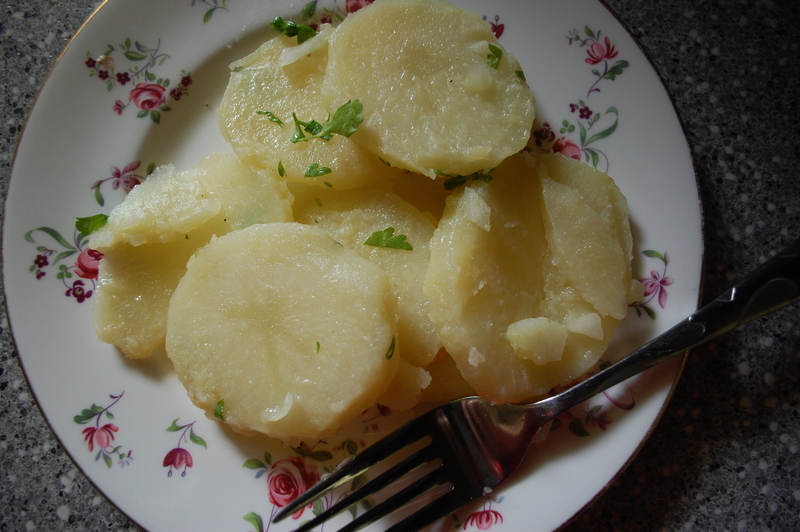 I made this for a weekend lunch and served it with a salad and herbed mash potatoes. It was easy! Big thanks to my 9 year old daughter Elizabeth for helping me in the kitchen-she rolled the pasties and also took some of the photographs you’ll see below! 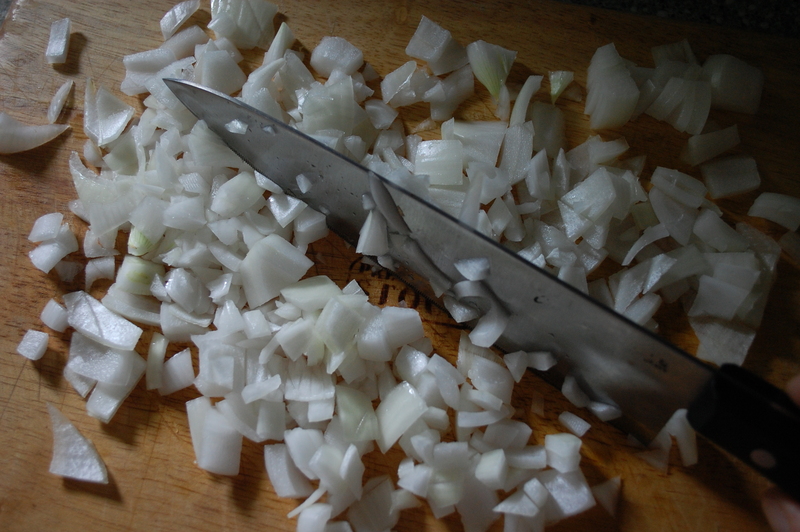 I always cry when I chop onions but it’s totally worth it! 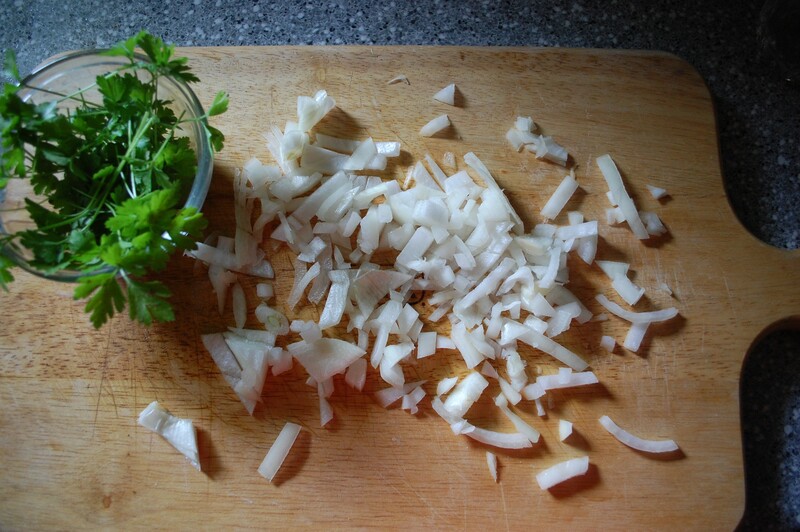 Add the onions and herbs and cook 3-5 minutes or just until the onions become soft and start to turn clear. 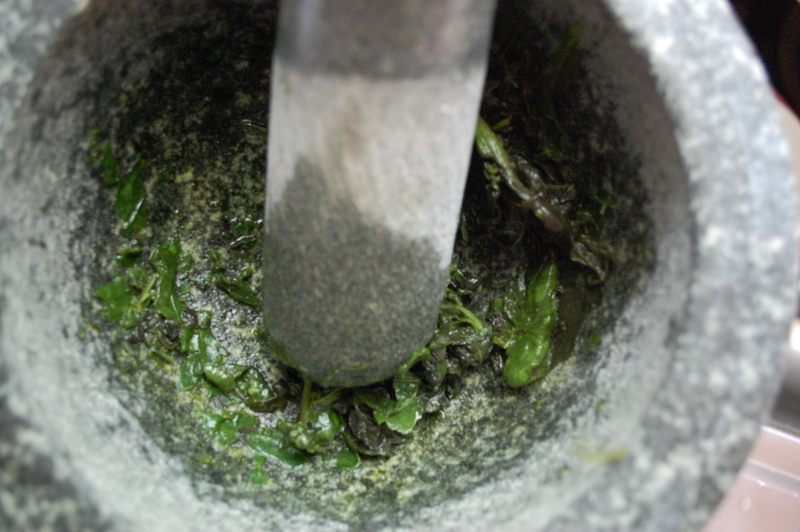 I also picked some basil from my garden and ground it with my mortar and pestle and added that to the mixture-I used about two handfuls of leaves. The ground basil. It smelled so good! 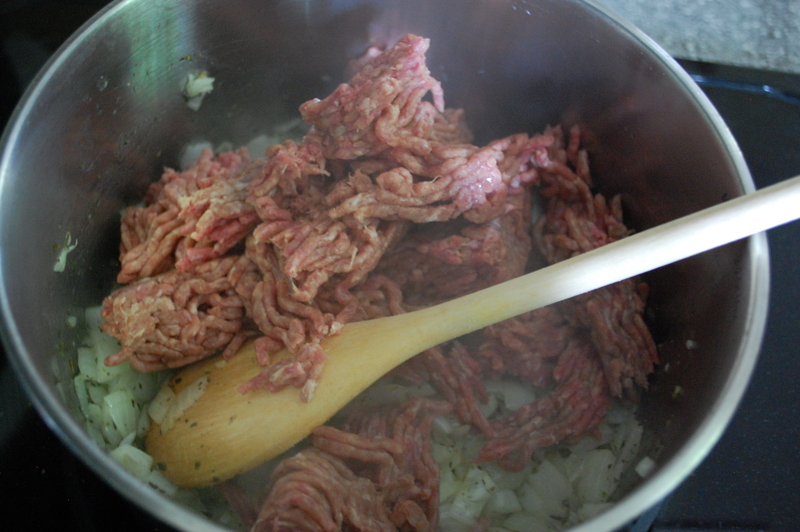 Add the beef and cook thoroughly throughout. Drain grease. 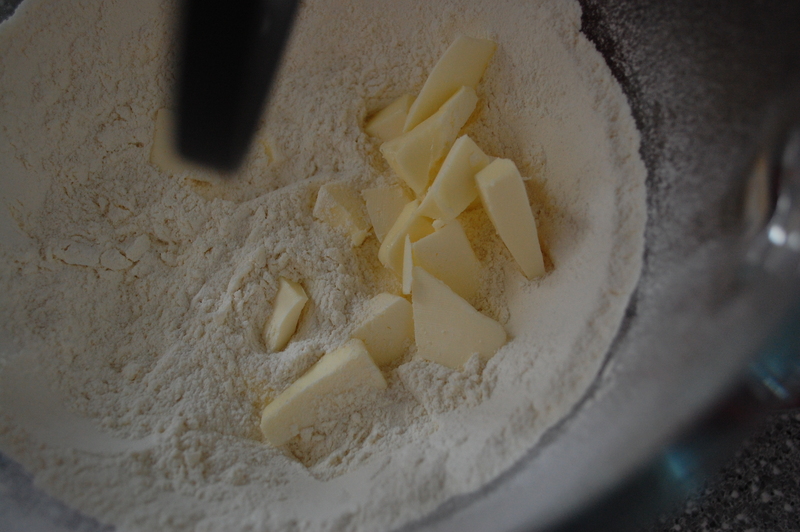 If using pie crust: On a lightly floured surface, roll out piecrust to ¼ inch thickness. Using a 3 inch round cutter, cut 24 circles. 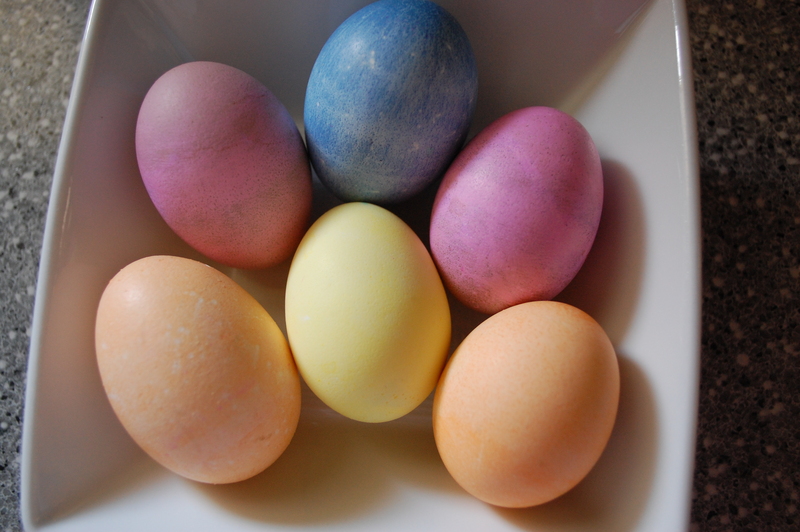 Lightly brush half the circles with egg wash. 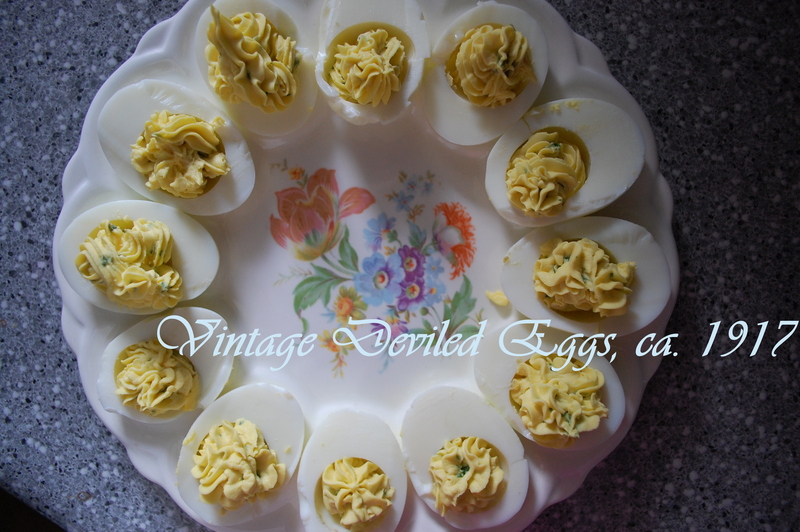 These egged halves are where you will put the cheese and meat when that step comes. 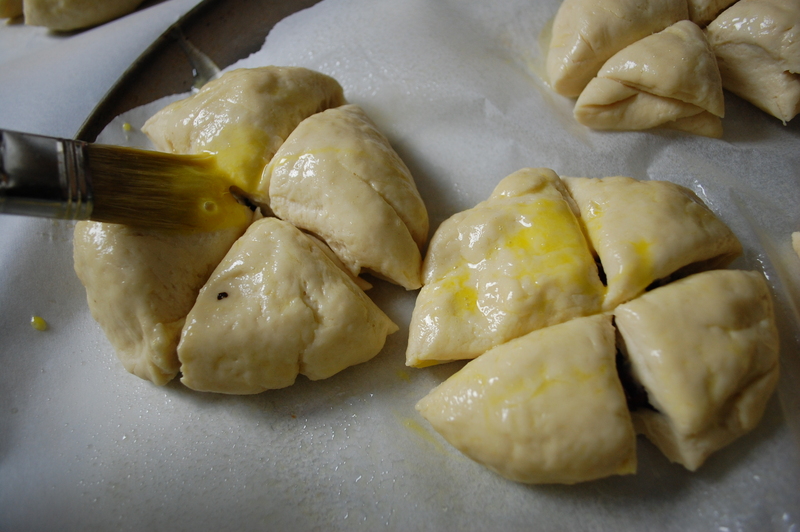 If using puff pastry: (NOTE: pull out one roll of pastry 2 hours before you begin this recipe, in order to give it time to thaw at room temperature). 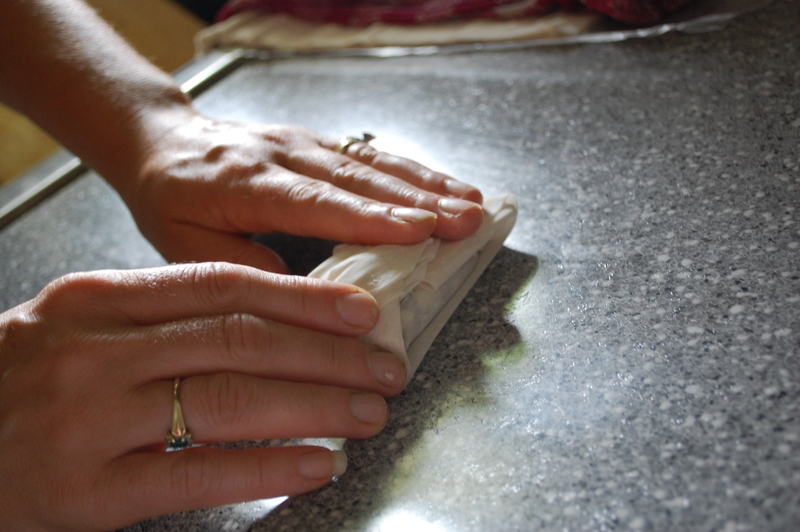 Roll out puff pastry on completely clean and dry surface. 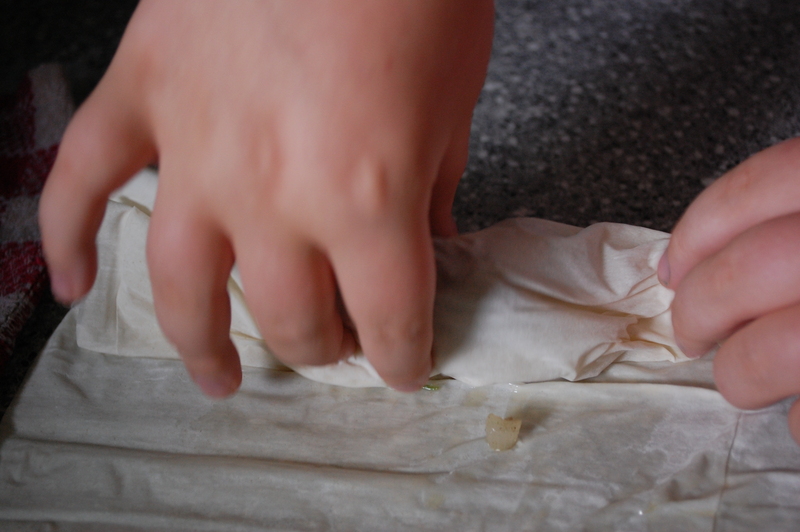 Immediately pull two sheets off and cover rest with plastic saran wrap and damp towel. Brush those two sheets of puff pastry lightly with butter. Puff pastry might seem intimidating to work with but once you get a rhythm down, it’s not trouble-and it tastes so good! 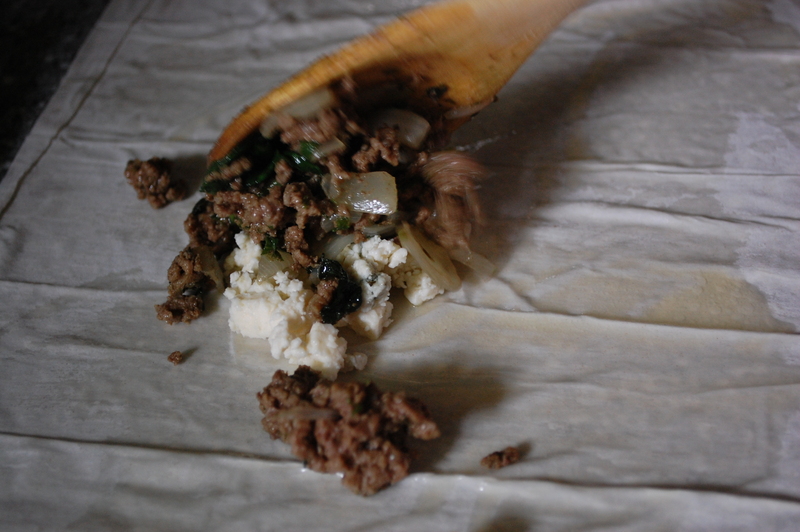 For either method, once the pie crust or puff pastry is prepared, spoon one teaspoon of blue cheese and two teaspoons of meat mixture onto surface. 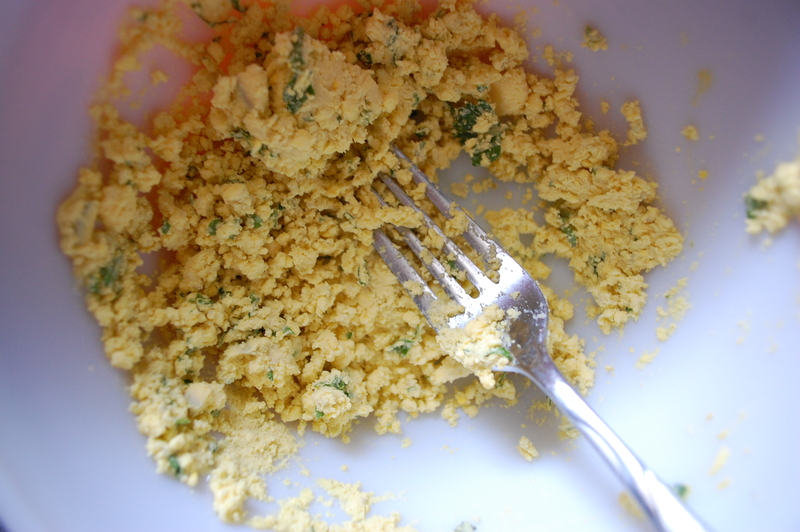 For pie crust-cover mixture with circle of pie crust not egg-washed. 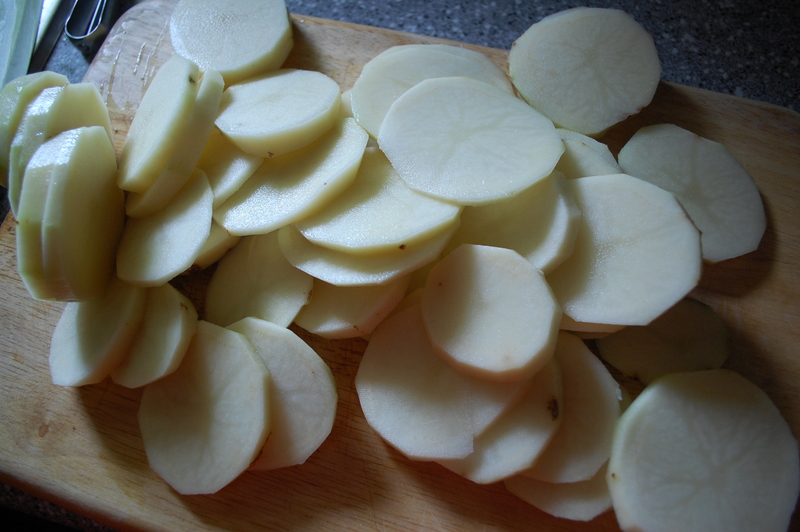 Crimp edges. 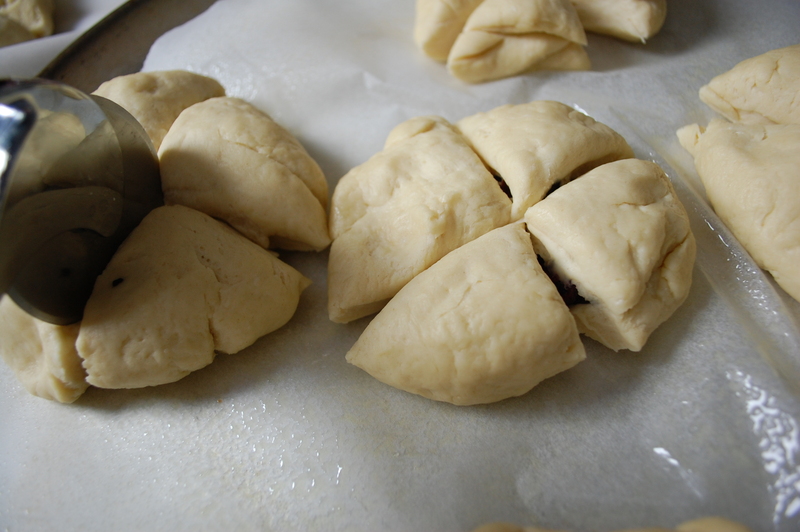 Set onto baking sheet and brush with egg wash.
For puff pastry-roll the pastry, beginning on one side and continuing to the other, then fold two edges into middle. She’s got good rolling skills! 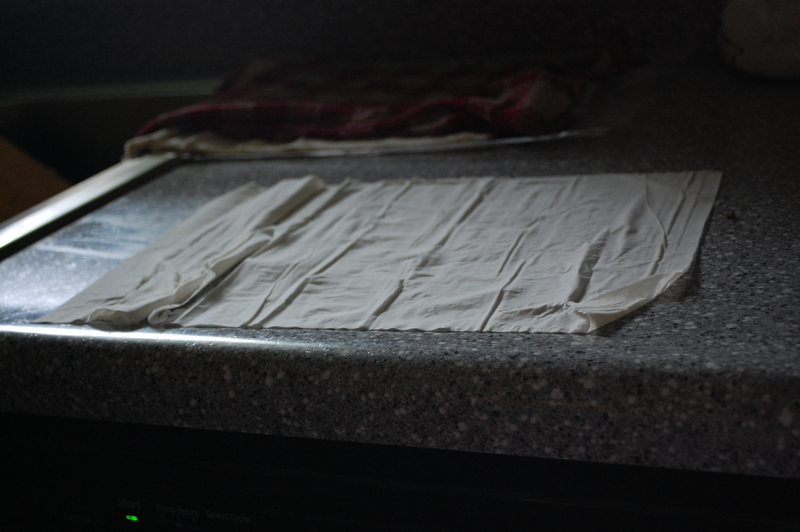 You fold the ends, then flip it over before putting it on the baking sheet. 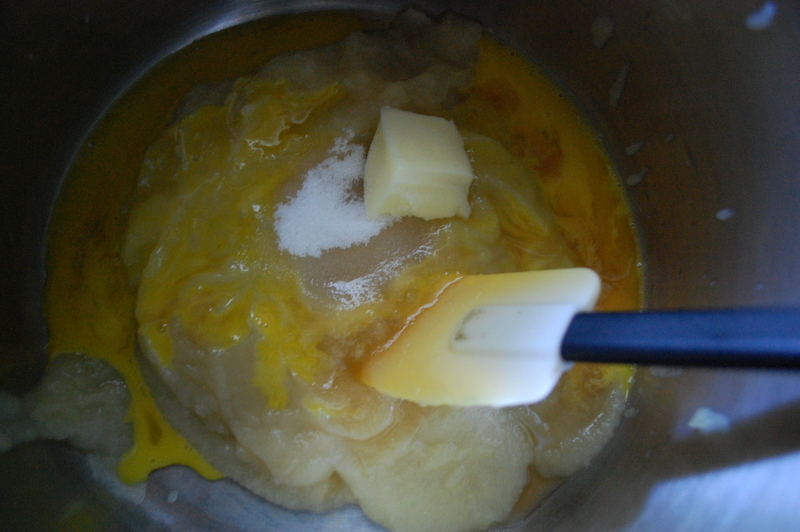 Place with the folds down on the baking sheet and brush with butter. 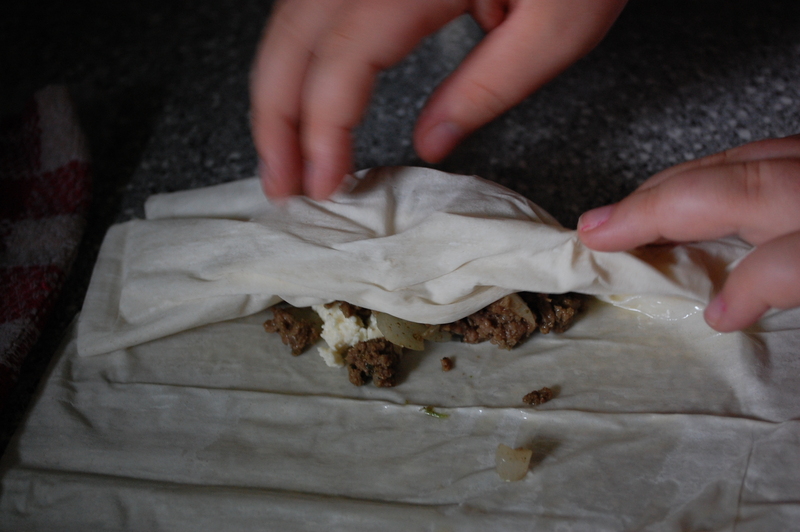 Repeat the whole process, pulling out two more sheets, brushing them with butter and filling theme with meat and cheese. 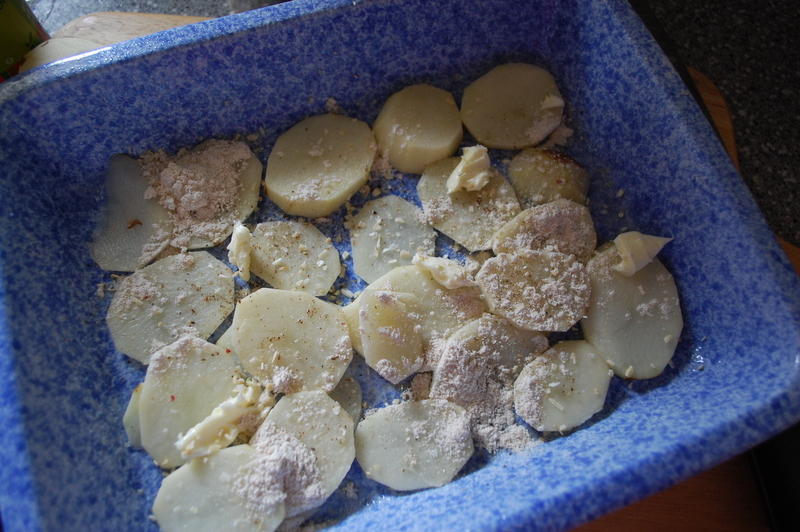 Bake for 17-25 minutes or until lightly browned. 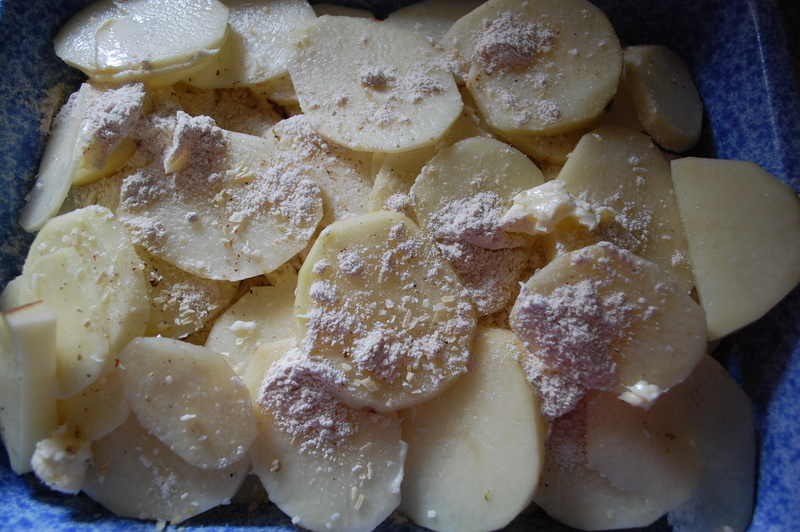 Serve immediately or freeze and rewarm in the oven.